The patented ChemLite™ Laser Aluminum Analyzer provides fast metals identification and analysis for Al, Ti, and Mg metals. The ChemLite works with the ease of a point-and-shoot device and the familiarity of a smartphone. Discover how its laser-induced breakdown spectroscopy (LIBS) technology allows light elements to be sensitively quantified like never before, with detection limits as low as 0.01%. Experience its safe and intuitive operation. ChemLite enables any user to operate and measure metal fast, in just 3 seconds! Just point and shoot for detailed analysis of alloying elements like Li, Mg, and Si. With laser accuracy on your side, you can make business decisions with greater confidence and maximize your crew's productivity, without stressing over regulatory burdens. Our proprietary algorithms report results in an instant on a large, easy-to-read touch screen display. 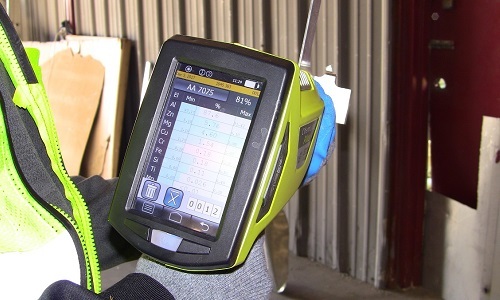 The ChemLite aluminum handheld instrument not only identifies alloy grade, but measures a full chemistry profile of the target, supporting applications that require superior light metals analysis. Try ChemLite for yourself. Request a live demo at your place of business.